Rest assured that here at University Park Healthcare we exemplify excellence in caring for our patients with compassion, empathy, and medical expertise. With high levels of communication amongst staff, patients, and family members the continuity of care will lead to a more successful outcome. Our nurses work with the residents family to create a comfortable environment including simple routines and visual cues as a positive substitute for diminishing mental processes. 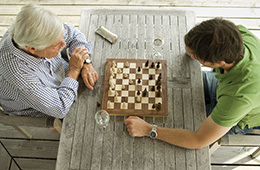 We also provide additional Occupational Therapy to assist with memory regenerative care.